#1. These obscene concrete garden hands. We’ve heard of the green thumb, but a middle finger? #2. This attempt at a scary-looking pumpkin that ended up being cute. #3. This glow-in-the-dark pumpkin that literally exploded from one too many coats of paint. #4. This condom-shaped hat that could probably only fit a toddler. Are you sure that’s the same pattern? #5. 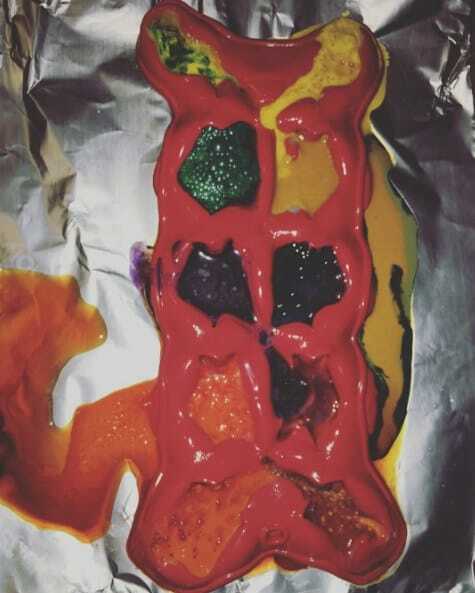 This monstrosity that was supposed to be vodka-soaked gummy bears. Don’t show this to your kids for two reasons: (1) there’s vodka in it, and (2) they might hate you for killing all the gummy bears. Learn the right way of making these here. #6. This Matisse bowl that ended up looking like a crumpled mess. #7. This Christmas decoration that needed at least five more strings of lights. #8. These apple pies baked in apples that looked like a graphic murder scene by the end. #9. This dinosaur-egg soap that hatched earlier than expected. #10. This snowman who turned up being less fortunate and less proportionate. #11. This melted crayon overkill. Go easy on the crayons next time, Bob Ross. #12. These melted crayons that set things on fire…; literally. #13. These really sad peppermint hot chocolate spoons. But hooray, she eventually made it work! #14. This T-shirt cat tent that unfortunately was more T-shirt, less tent. #15. This halfhearted attempt at repurposing a broken plate as a mosaic pot. #16. This fortune cookie that more closely resembled Pac-Man. #17. This plastic light switch cover that got nuked in the oven, for some reason. This is the proper way to do it. And yes, no electrical kitchen gadgets required. #18. And this sorry attempt at glow-in-the-dark sneakers that somehow ended up leaving more paint on the table than on the shoes. Craft lesson #82: Screw your caps on tightly, people!